In the aquarium it presents itself as a blue green slime that is very common to show up in the front of the aquarium near the glass, however it quickly spreads itself everywhere covering the plants and stopping photosynthesis, if nothing is done it ends up killing the plants. While we know it for its common green look in freshwater aquariums, it actually presents itself in many different colours. To give an example of this, in the marine aquariums where its actually more common it generally presents itself in a pink reddish colour. They thrive in warm water that is rich in nutrients, the problem with this it is that it really does not need Ammonia, nitrites and nitrates to photosynthesize. They can do this at a molecular level through a process called nitrogen fixation. This is the process from which some bacteria can process atmospheric nitrogen into ammonia. Nitrogen is 79% of our atmosphere, which means there is a lot of it, however most organisms can't use it. Through this process however bacteria can, and because cyano is a bacteria they can survive even when there is no nutrients to feed them. This is the same process that powers our nitrogen cycle in our filters. I will put links into pages detailing this process in the sources section as this is quite complex. Due to being able to sort out its own food cyanobacteria is very hard to eradicate in the aquarium. Many hobbyists have given up victims to it. There are a few things that are known to cause outbreaks. In my experience the most common one is dirty substrates/filters. Either due to bad maintenance practices, or because over time there is a build of organics. This leads to ammonia being released which brings about an outbreak. In some cases it shows in newly setups which this is also related to excess ammonia. We can also normally find it in dead spots, this is however related to a lack of flow that leads to debris being deposited in these areas. 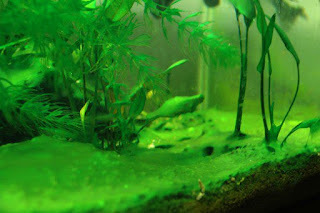 Finally it is extremely common to have this algae in tanks with very low levels of nitrates. However its not 100% clear to me if this is a cause or symptom. When cyanobacteria is present apart from the obvious green slime growing everywhere, a foul smell can sometimes be detected and the levels of nitrate in the aquarium tend to be zero or very close to it. It is extremely difficult to get rid of cyanobacteria, especially because the methods that are so successful with other types of algae, don't really work here. 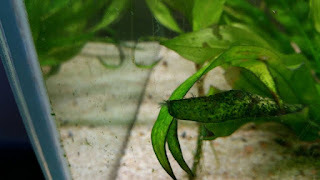 Clean up the aquarium, removing as much of the visible alga as possible. It is fairly easy to remove. Vacuum the substrate thoroughly to get rid of any build up of organic waste and clean your filter. Do a 30 to 50% water change while doing this. Dose potassium nitrate and make sure to always keep the level at 20 ppm. Remember it thrives in low nitrate environments. Replace your co2, with an air stone. Cyanobacteria thrives in low oxygen environments, if you notice carefully it is common to see it in anaerobic pockets underneath the substrate. This is very easy to see when sand is used. Do a blackout. Cover your tank completely for three days. No light at all can go through. I recommend using some black plastic bags and some tape and wrap the tank in it. Keep your lights off during this process. Don't worry about the plants, as they can survive the process. And don't feed the fish, they will also be fine. Do a large water change and remove any dead algae you find, dose some more potassium nitrate to keep it at 20 ppm, turn on your co2 and light and increase your flow to avoid dead spots and waste building up. Unfortunately sometimes it still comes back after the blackout. There is a last resort solution to kill cyanobacteria. And that is to use the antibiotic erythromycin (Maracyn in the UK) to kill it. Because it is in essence a bacteria, it can be killed by antibiotics. However this means it will also kill the beneficial bacteria in your filter. Do not take the use of this method lightly, follow the instructions on the box to the letter otherwise you will risk creating a strain of cyanobacteria that is resistant, which will make it impossible to eradicate. Cyanobacteria has been on a personal level an algae that i have rarely found, two times only to be more precise, however when i had it, it was a real pain to fight, mostly because i was wrongly assuming that it could be killed using the same methods that are used on every other type of algae. I hope this will help in understanding why its difficult and different to get rid of it.